Michigan’s nine-year journey toward a law to license Certified Professional Midwives was nothing less than a heroic quest. How better to portray it than through the story of The Lord of the Rings? The first book in Tolkien’s trilogy, The Fellowship of the Ring, seemed an appropriate choice to describe the hopes and strivings of the merry band of sisters that – slowly, excruciatingly – pushed legislation from opposition to enactment. Material in this cartoon was taken from Tolkien’s books and Peter Jackson’s films. Many liberties were taken with both Tolkien’s story and Michigan legislative history. Events portrayed did not necessarily occur exactly as shown. Objects in mirror are closer than they appear. Onwards! One does not simply walk into Mordor. Its black gates are guarded by more than just orcs. There is evil there that does not sleep. The great eye is ever watchful. It is a barren wasteland, riddled with fire, ash, and dust. The very air you breathe is a poisonous fume. Not with ten thousand men could you do this. It is folly. In our cartoon, Mordor is represented by Lansing; make of this comparison what you will. The capitol building is shown in Frame 2 foregrounded against a very angry-looking Mount Doom. The Michigan Legislature badge pinned to the building is worn by every legislator in this cartoon. Watch for it! Drives to Lansing, while not perhaps as heroic as journeys on horse or on foot with staff and backpack, were nevertheless fraught with the unforeseen (Frame 3). A great number of the Fellowship were midwives and parents; illness, childcare problems, women in labor, last-minute texts, and typical midwife-style driving featured frequently. Midwives are not usually called to births by eagles (Frame 4), but fantasy permits us this fiction. 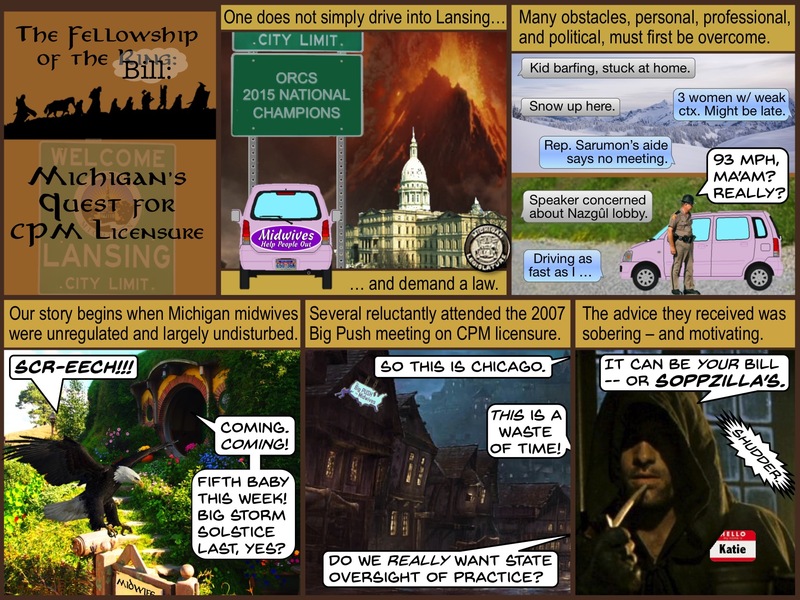 Fantasy extended to the legal position of Michigan midwives pre-licensure. Some opponents of licensure believed the practice of home birth midwifery to be legal on the basis of Michigan v. Hildy, a 1939 judicial decision itself based on a much earlier Attorney General’s opinion. Supporters of licensure, however, pointed out that the enactment of the 1978 Public Health Code superseded the old decision because of its overhaul of health care professional licensure. In addition, even should a midwife succeed in fighting off a criminal conviction by citing Hildy, a licensure act in and of itself would alert the judiciary and prosecutors alike that out-of-hospital midwifery was regulated, and therefore not a crime. Several Michigan midwives who doubted the need for licensure attended a 2007 Chicago summit offered by The Big Push for Midwives, a national advocacy group formed to support and coordinate state CPM licensure efforts (Frame 5). The midwives underwent a conversion experience, driven in part by warnings of plans underway by the American Medical Association to further restrict midwifery scope of practice with its “Scope of Practice Partnership” initiative. The Big Push urged states to initiate licensure legislation in order to forestall the AMA’s plans, which were cleverly portrayed by Pushers as “SoPPzilla” (Frame 6, and see next page). Strider, a.k.a. Aragorn, is revealed here to be Katie Hemple, a member of The Big Push Steering Committee. Categories: law, maternity care | Tags: cartoons, Certified Professional Midwife, fellowship of the bill, licensure | Permalink.